Although sophomore Kasey Lange, shown here in earlier action, hit a home run at the top of the sixth inning to tie up Tuesday night’s game, the Harvard softball team fell to Providence, 3-2, Tuesday night. An inning after tying the game with a solo home run, sophomore Kasey Lange stepped back up to the plate with the Harvard softball team trailing by one once again and now down to its final out. With a runner on second, Lange had a chance to give the Crimson its first lead of the day over Providence, but that opportunity was summarily taken away. The Friars elected to intentionally walk Lange to bring up co-captain Whitney Shaw. The plan paid off as Shaw popped out to give Providence (13-18, 4-1) a 3-2, home victory Tuesday. The Friars took a 1-0 lead in the bottom of the first inning when junior Jesse Bryant went deep on co-captain Rachel Brown, who was pitching in her fifth game in five days. In the top of the inning, sophomore Shelbi Olson got to third on a single, a wild pitch, and a ground ball out, but Shaw was unable to bring her home as she popped out. Providence added to its lead in the third when senior Michelle Huber scored after an error by senior shortstop Jane Alexander kept the inning alive. Through three innings, Harvard (15-9, 3-1) had stranded all three baserunners that had reached first safely. Shaw walked to start the inning, and freshman Andrea Del Conte came in to pinch run. Del Conte stole second before watching two batters pop out. With two outs, senior Marika Zumbro knocked Del Conte in with her first of two hits on the day, narrowing the deficit to 2-1 and earning her first RBI of the season. Lange eliminated the gap altogether with a solo home run to lead off the sixth inning. The Crimson offense continued to be a threat, generating back-to-back singles after a pair of groundouts, but the attack eventually stalled. The game did not stay tied for long as the Friars came right back in the bottom of the sixth and did more damage, this time off sophomore Laura Ricciardone, who had entered the game for Brown after the senior pitched a scoreless fourth inning. In four innings, Brown had fanned seven. Ricciardone got the first batter out in the sixth but then surrendered a walk and a single. The next batter, junior Stephanie Kiesel, made Ricciardone pay with a double that scored one and left runners at second and third. The Friars then attempted a double steal that failed, leaving Kiesel at third as the only baserunner. Ricciardone ended the inning with a strikeout, but only after the home team had gained a 3-2 advantage. Going for a complete game, junior Corinne Clauss began the seventh inning by getting junior Ashley Heritage to ground out. 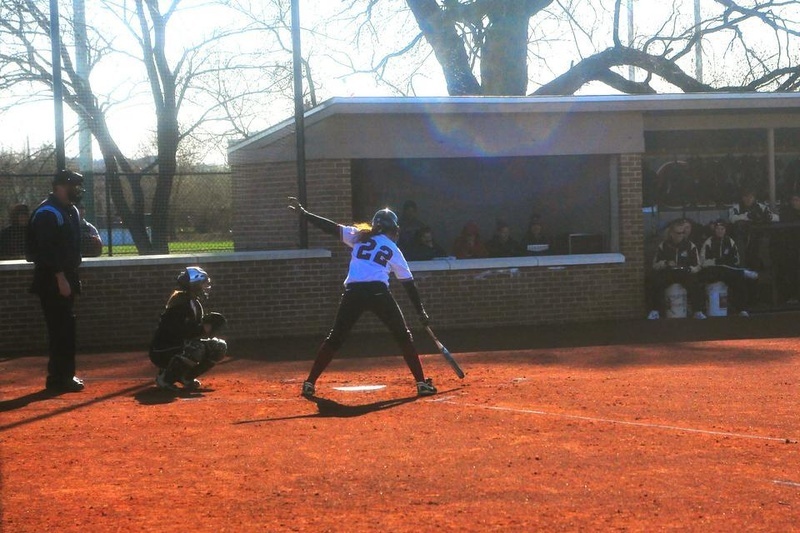 Senior Jane Alexander then put pressure on Providence with a base hit to left field, her second single of the game. Alexander then advanced to second on a groundout by Olson that brought Lange to the plate.